Topic : "Nexus Inn - part one"
Putting this here so I can cross-link from the original thread (rather than overload it). I realize some people are gonna hate me for all the flat areas, lol - and now that I see it all in one post, it's truly a horror/headache (all the horizontals and values echoing & competing (including horizontals between images)): gotta break it between posts (standby for that). Been previewing it as a slide show; didn't expect this. C&C welcome, as always. Not sure I'll continue beyond what's scripted but want to get it out of the way (four years later). Still needs tweaking, xtras (more workers), etc. (plus pacing issues). Anyhow, onward. 1.The angles are very straight forward all the way. There is not much drama going on here. Imagine this as a short movie. there would have been more close-ups, different camera-angles etc to grab the viewer. 2.The scenes can be cropped into a more dramatic shot. There is really no need for all the dead "air" in the pictures unless you want to convey loneliness or melancholy etc..
3.The thin lines make it hard to make out the characters why not make them "pop" more with having a more varied thickness to the lines? 4. When doing simplified drawings like this i think it is important to be aware what you want to keep and what you dont need to keep and how that effects the result. For example - The beard has a line all the way around it, still the nose has no lines at all except for when seen in profile. It doesnt make sense. 5. Come to think about it now. Are these 3D models rendered with a cartoon-plugin? The lines are very edgy and angeled + it might explain what i mentioned in the point above about the nose not having a line. I have worked with cartoon-plug-ins before and that is one of the issues i remember from it. If this is 3D it would give you a lot of possibillities with camera-angles without not too much hassle. At the same time i think you can tweak the shadows more in order to get some more out of the shapes. Also if this is rendered, you can always do some touch-ups, like adding moe in-lines within the shapes. Fingers, ears for example. 6. Might wanna ask yourself too: when kept this simple would�nt it be easier to just draw the entire thing? - If it is rendered why try to emulate a comic-style without using the full potential and advantage of 3D? I like the bearded guy, though. He�s cool! Hehe, I did. Thanks for the very detailed/considered reply. Given the slow pace (of the forum), I stopped asking for C&C (no one's around to give it?). The main point in these cartoons is to convert the original vectors from (Microsoft) Word to Inkscape. I mentioned this elsewhere, though I don't assume anyone's listening - again, with the forum being so slow I feel like I'm 'talking to myself', hehe. My fault for not mentioning Inkscape (for clarity). Your own work, and now the "Commander Naz Art" discussion, strikes a chord - here's part of the reason (below). That's my last effort with pencil and Rapidographs, before I got concerned with digital and 'lost control'. So: your reply (above) is useful in both directions (pencil or digital). Still got your earlier advice in mind (re pencil/portability). Any further advice is always welcome. Yeah, i know that feeling. Let's just hope that the forum kicks off again. It really used to be a fun place with a lot of talented individuals that were willing to help. I forgot to mention that your comic reads very well i must say. It is just that it seems to be a little too much space around the characters when it's not really needed + the angles that i also mentioned. The last pic is cool. It comes alive more, dont you think? Glad you found the advice useful. Thanks micke, understood re shading/depth. Agreed the line work is more "alive"/fluid/prehensile - all that good stuff. So yeah: how to bring it all together? Obviously everything has to 'flow' (script, graphics, pacing). I'm happy with the script and bartender (glad you like) - the guy who's tending to steal the show via force of personality (disproportionate to other characters, for the moment). One of my main concerns is, how to render detail consistently across multiple frames: continuity. I prefer *lots* of detail (post-it notes on walls, etc. ); the mainly empty frames allow for that (background characters/detail, as mentioned above), though not to dismiss your point (good one). Apart from 3D (my processor's inadequate anyhow), I've all but decided continuity can be sacrificed (even in the movies it's not perfect). Just hit me: the level of detail can be proportionate to how often a particular 'set' is used (ie. single-use scenes can be highly detailed since they aren't rotated/drawn over and over...?). Note to self. Anyhoo, I think I'm doing okay, given the relatively brief time I've been working on it. When I narrow the focus to a particular medium/method, it should come together fairly quick. Oh: re "angles", I'm not confident enough in perspective, just yet. It'll come (gotta push the comfort zone, sooner or later, hehe). The funny thing is that the bartender looks exactly like the old man that worked in our old canteen, LOL! About the details: How about adding some details to the models? Also it could be worth to try and make the models less "round" and more facet-like. It might bring out more details with the cartoon-plug-in. Just thinking out loud here. Not sure if it will work. And with the angles i mean that you can have close-ups, long-shots, bird perspective, frog-perspective and things like that. It adds life and variation. Hi micke, sorry for not being clear, this comic (top of thread) isn't 3D, it's vectors (Inkscape is a vectors program; similar to Micrografx Designer, CorelDraw, etc.). Again, working solo I've developed a habit of 'talking to myself', hehe, so I'm not as cautious about clarity as I should be (ie. I tend to think that if I know it, or if I've written it somewhere, others know it too). Bad habit! Understood re angles/perspective (see: "I'm not confident enough in perspective, just yet"). I'll get there, eventually. 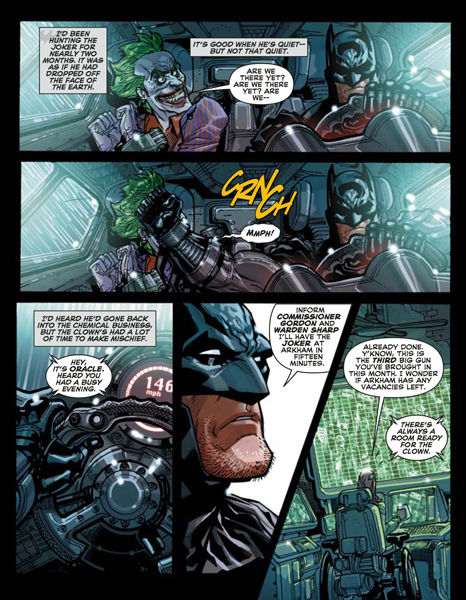 Thanks for the example, the first two panels are a perfect example of one of my concerns (mentioned above): only Batman's arm is re-drawn (and highlights redone, now that I look closer), the rest of the panel is reused. Cool. I thought they were cell-shaded 3d too. No worries, I gotta stop yacking so much anyhow (it's not a 'language arts' forum). Er, if I get too rusty, someone will have to help with scriptwriting (lots of that yet to do). Sumaleth, I don't know what "cell-shaded 3d" is but now I know I can emulate it [resume update]. Thanks. 3D Cell shading shades the model in a way so that it looks like traditional cell-animation. Mainly used in games, but also sometimes in films and TV-series. Thanks for the example and notes. Rather than start another 'part x' thread, I'll apologize (again) to anyone watching this topic (multiple email notices) and dump them all here. And again, separate posts to avoid loading the page (see "dialup"; and again (yet again, lol), I'll be happy for everyone when dialup is extinct). By now I think the best way to describe this series is "storyboarding". Will tackle 'art' concerns later.